Those businesses with the letters next to them and a place on the map is a business listing. For a local business like yours, this is the best place to be because this is what paying customers see when they type something like “Wrecker Service” in Asheville NC. Our Internet advertising agency can get your business on the very first page for the popular services you provide with the name of your company, website, address, phone number, even customer reviews and a mark on the map in the right hand corner. Our client in this example has been with us for many years, and you see that they’ve made it to the top of an organic search as well, which is great. 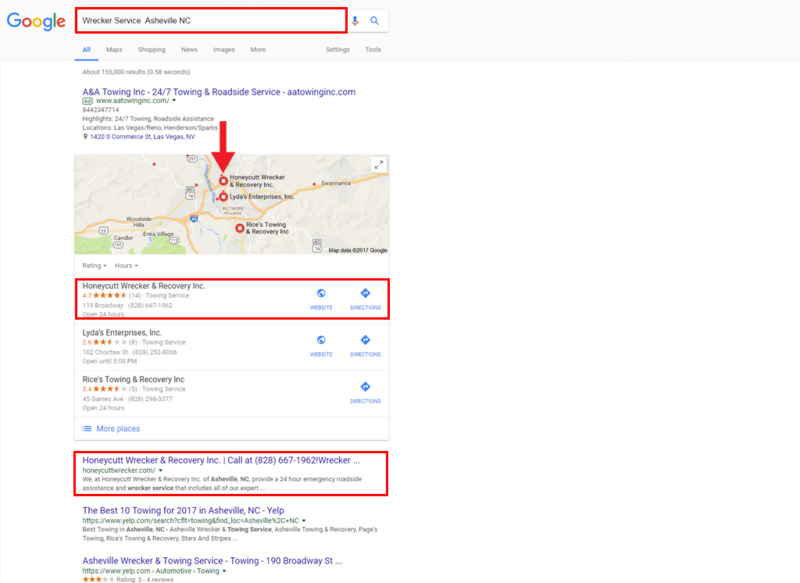 We focus on local SEO because that is where the money is for businesses like yours, however, these are the kinds of results our clients that have been with us for years see over time. Can I do this without an Internet marketing service? Good question, we’re glad you asked; and the simple answer is… kind of. You see in your area, there are a TON of other businesses like yours that also want to be on the first page. What we do is called optimization, and our online marketing agency does it for your local market, so you are seen by your local customers. This has meant a lot more money in the bank for 40,000+ of our clients and counting. So yes, you can get listed with Google on their business listing all by yourself, and chances are; your business will be all by itself too because your competitors will be the ones who show up on the first page.